PHILADELPHIA — Erik Karlsson failed on a chance to get the Ottawa Senators a win in overtime, but he came through in the shootout. After Kyle Turris tied the game with less than two minutes remaining in the third period, Karlsson scored in the fifth round of the shootout to give the Senators a 3-2 victory against the Philadelphia Flyers at Wells Fargo Center on Tuesday. On his deciding goal, Karlsson’s wrist shot went in off the inside of the right post for his second shootout winner of the season. A more relaxed attitude could have helped him late in overtime when he had a 2-on-0 break with Turris. Karlsson carried the puck into the slot, stopped and tried centering the puck to Turris, but Flyers goalie Steve Mason got his stick on the pass to break up the play with 1:16 remaining. The Senators tied it 2-2 when Turris scored on a wraparound with 1:59 remaining in the third period. Turris skated down the right side of the Flyers zone, circled behind the net, and when Mason overplayed him to the right, he had an open net to tuck the puck in on the left side. Mark Stone also scored for the Senators (10-5-1). 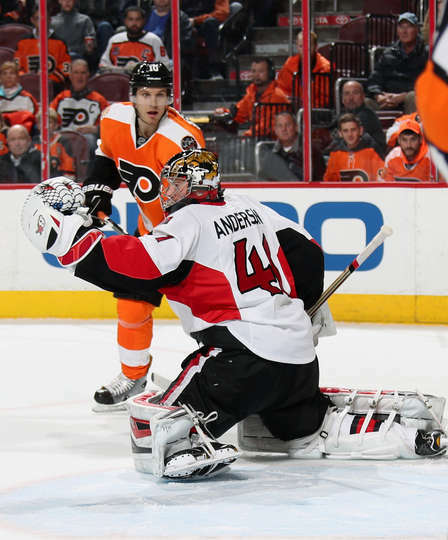 Anderson made 33 saves through overtime and stopped all five Flyers in the shootout. The Senators killed four Flyers power plays, extending their streak of consecutive penalty kills to 27 spanning 11 games. Philadelphia entered the game with the best power play in the NHL and had scored a man-advantage goal in five straight games. “Good coaching staff telling us the right scouting and making sure that we know what we’re all doing so there’s no confusion,” Anderson said. Michael Raffl and Nick Cousins scored for the Flyers (7-7-2), and Mason made 24 saves through overtime. Raffl gave the Flyers a 2-1 lead at 13:18 of the second period when he scored off the rebound of Dale Weise’s slap shot from the left boards. That advantage held until Turris tied it. “That’s a game that while we have it in hand, we’ve got to do a little bit more and we have to push it so one play doesn’t tie it up late in a hockey game,” Flyers coach Dave Hakstol said. Cousins gave the Flyers a 1-0 lead when he jumped on a neutral-zone turnover by Senators center Derick Brassard and scored on a breakaway at 5:14 of the first period. Stone scored at 7:09 of the second to tie it 1-1. Turris’ goal at 18:01 of the third period was his eighth of the season, seventh at even strength, tied for second in the NHL. Zack Smith chipped a pass around Flyers defenseman Michael Del Zotto to Jean-Gabriel Pageau entering the Philadelphia zone to create a breakaway, but Mason stayed on his feet and got his chest on Pageau’s shot at 9:31 of the first period. Pageau sent Stone in on a breakaway at 15:15 of the second period, but Flyers defenseman Radko Gudas raced back and lifted Stone’s stick to prevent him from getting off a shot. Pierre-Edouard Bellemare broke his stick blocking a Karlsson shot on a Senators power play at 14:18 of the third period and couldn’t get another one. When a puck bounced into the high slot, he kicked it away from Mike Hoffman, and then beat Hoffman to the puck on the wall and kicked it out of the zone. Karlsson’s assist gave him 399 NHL points. He’s one away from becoming the 12th active defenseman with 400 points. … Weise’s assist on Raffl’s goal was his first point in eight games.